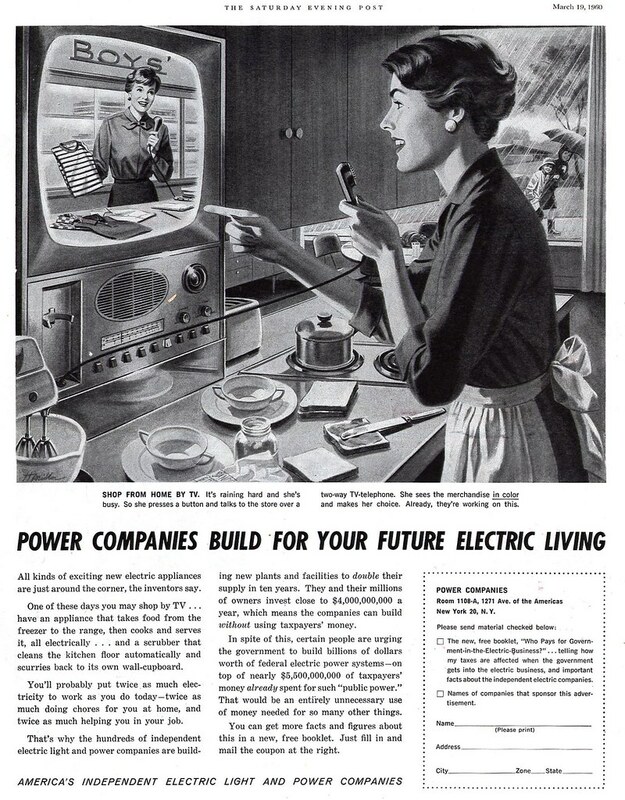 Today's Inspiration: What Happened to the Future?! What Happened to the Future?! 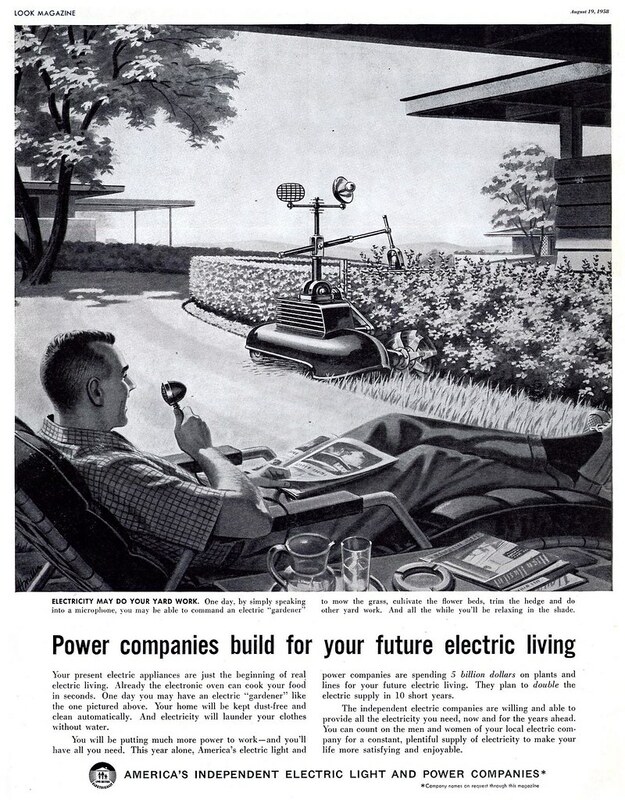 Seems like we were supposed to gain extra hours of leisure time, sit in the garden, and give orders to some computerized gizmo. Instead, we endure extra hours of commuting time, sit in a cubicle, and take orders from some computerized gizmo. This is the American Dream? 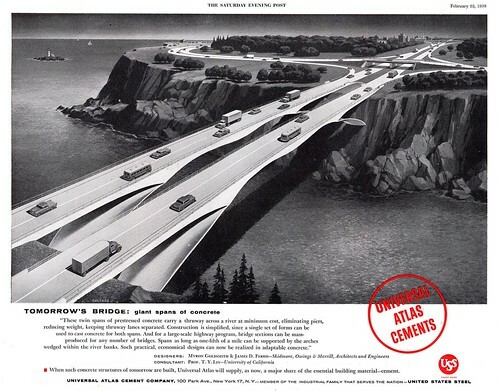 Illustrator Frank Soltesz's gracefully sweeping ribbon of concrete might not have looked quite so appealing if he had filled it with idling cars from horizon to horizon, obscured in a haze of smog and surrounded on all sides by Wal-Mart parking lots and Home Depots. Housing will still be crucial in 1975. 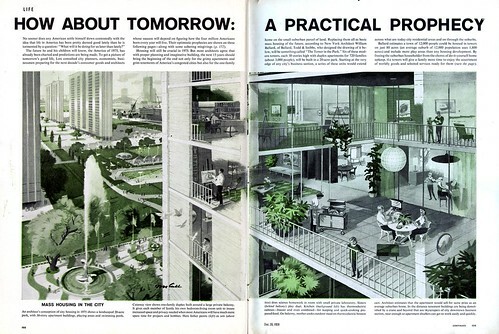 But most architects agree that with proper planning and imaginative building, the next 15 years should bring the beginning of the end not only for the grimy apartments and grim tenements of America's congested cities but also for the one-family home on the small suburban parcel of land. Replacing them all as basic mass housing of the future...will be something called "The Tower in the Park". Six of these modern towers, each 30 stories high with duplex apartments for 720 families (about 3,000 people), will be built in a 20-acre park. Starting at the very edge of any city's business section, a series of these units would extend across what are today city residential areas and on through the suburbs. If the good life of the future is not to degenerate into a vast traffic jam and a strangled complex of cities, there is urgent need for immediate urban, regional, statewide and nationwide master planning. The growth of the cities will not be an evil if we make them again a pleasant place to stroll, eat, shop, sightsee, enjoy cultural amenities, and live. Only then will our leisure time be worth living. Otherwise, we will spend our precious hard-earned leisure within our own four walls, cut off from society by the foes we have created: murderous traffic, smog, disorder, blight and ugliness. We will be trapped in our suburban or city homes, all dressed up with no place to go. You'll find all of today's illustrations at full size in my Flickr set of The Future. Mad Magazine has done fantastic parodies of these kind of illustrations over the years. They were spot-on visual duplicates of these utopian visions that never came to pass, usually created by artists like Wally Wood or Kelly Freas. The guy in his yard giving orders to his hedge trimming robot could've been one of those pieces. It's hilarious. Bruce McCall is doing these kind of things now, often as New Yorker covers. My neighbor has one of those lawnmowers. It's GPS guided but he still goes out to watch over it.